Tanking has a long history as a moisture control technique in damp cellars. The prevalence of this practice is easy to understand. Early stone foundations were often laid up with little or no mortar to fill and seal gaps between stones. Builders and the property owners who hired them expected these foundations to leak. When modern, cement-based mortars became available, the possibility of covering a rough, uneven stone foundation with a layer of mortar caught on quickly. Tanking yields a smooth, seamless wall surface that improves the appearance of a basement while also providing better moisture control. 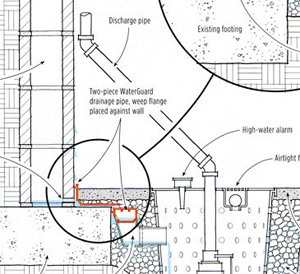 Cement tanking and membrane-based tanking systems work on the premise that a thin protective layer applied to the inside face of a damp basement wall can stop all moisture penetration. In practice, this is true some of the time, but not all the time. Experienced basement waterproofing contractors understand that tanking is one of several useful ways to solve your wet basement problems. When dealing with a wet cellar, it’s smart to assume that even if tanking is completed as a waterproofing method, some water may still leak into your basement. This often happens when cracks develop in a basement structure and when pressure forces water up through the joint between the wall and the basement’s slab floor. At Basement Systems GB, we recommend that homeowners protect themselves from a wet basement or wet cellar problems with our patented WaterGuard® system. 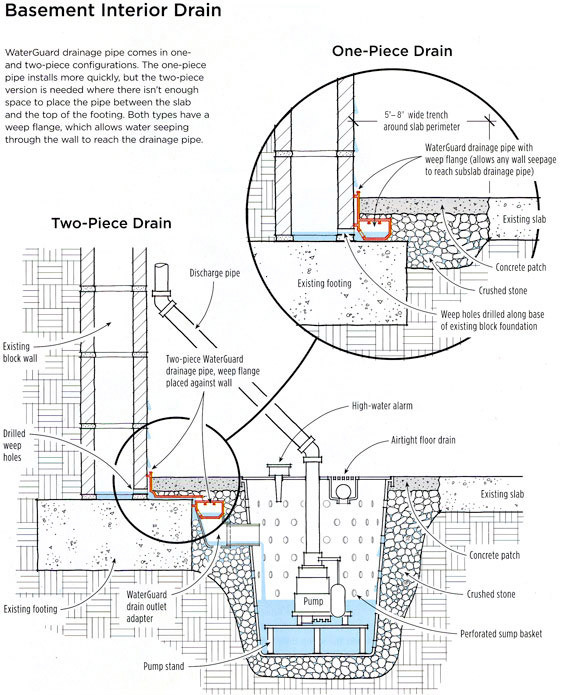 WaterGuard® creates a concealed drainage channel around the perimeter of the basement floor that directs all unwanted basement water to a sump pump, where it can be pumped outside. Made from strong, durable plastic that won’t corrode, clog or break, this specially designed drainage system captures any water that leaks through the walls, and/or between the walls and the floor slab.